The National Eating Disorder Association (NEDA) says that binge eating disorders are the most common eating disorder in the United States. The association says that while it can affect men and women of all ages, binge eating usually affects women in early adulthood and affects men midlife. For these reasons, it's important to understand the risk factors and symptoms of binge eating so that you can help yourself or even a loved one who might be suffering. Many times binge eaters hide their behaviors well, so pay close attention to the ways this disorder can be brought on as well as how someone who binges may act. Doctors don't know what exactly causes binge eating disorders, but the Mayo Clinic says a combination of genetics, biological factors, long-term dieting and psychological issues can all contribute to the disorder. Family history: If a family member had, or has, an eating disorder, you might have inherited the gene that increases your risk for developing a binge eating disorder. Psychological issues: Many times, people who are battling binge eating have low self-esteem and think negatively about themselves, their skills and their accomplishments. 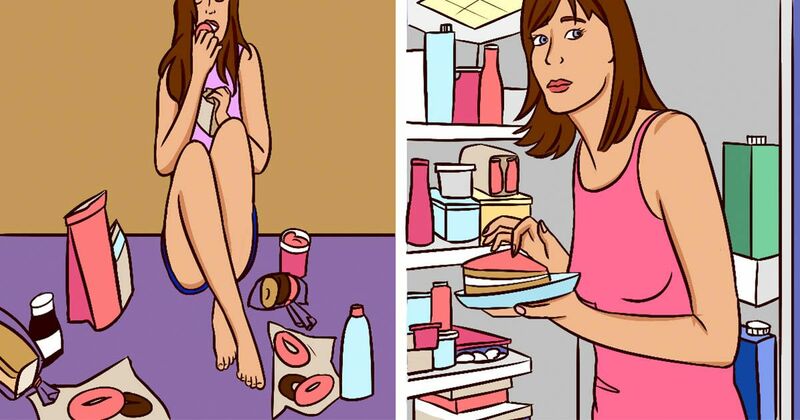 Common triggers for binge eating include stress, poor body image and boredom. Dieting: Dieting can be bad for your body and mental health. And many times, people who have dieted for long periods of time — restricting calories and food in general — can be triggered or urged to binge. Age: Binge eating affects people of all ages, but most times the disorder is brought on in the late teens or early 20s. Often people with a binge eating disorder become very good at hiding their condition. But if you know someone who displays the signs and symptoms above and you are worried, it's important to have an open conversation with that person about your concerns. You might be able to help them get the treatment they need, and possibly even help them recognize a problem they didn't know they had. NEDA says that treating a binge disorder can require certain therapies like cognitive behavioral therapy (CBT), interpersonal therapy (IPT), dialectical behavioral therapy (DBT) or pharmacotherapy. But, like many disorders, each diagnosis needs to be treated individually. In consultation with a doctor or health care specialist, you can figure out the best treatment for your body and any current conditions. NEDA has a list of treatment providers who specialize in binge eating disorders, and you can check that out here.